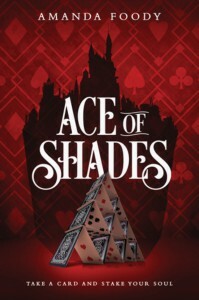 This is one of the most talked about and most anticipated YA novels of the year (and it is only April); maybe it’s the hot red cover, or the invitation to "Take a card and stake your soul." Even if you usually shy away from books because of the hype around them, don't miss this one. "To be frank, reader, you'd be better off not visiting the city at all,"
in reference to the city of New Reynes, the so-called City of Sin (move over, Las Vegas), the city that ‘Ace’ is set in, and naturally, like most things we are warned against doing, we are more drawn in. Allow yourself into the world that author Amanda Foody has created, one where our lead character, Enne Salta has gone on a desparate mission to find her mother Lourdes, who she hasn't seen or heard from in months. Her one lead is a street lord, Levi Glaisyer, who is indebted to a con man, and lives under the clutches of a ruthless and frightening Mafia Donna called Vianca. Enne quickly finds herself shedding her finishing school veneer, and becomes entrenched in the ways of New Reynes, which is filled with illicit casinos, three rival gangs, and more shady characters than a Godfather movie (almost). Now onto the guts of my review (and there really were a lot of guts spilled in this book; it’s pretty violent, though no sexual violence, in case you're wondering about triggers). I’d say Enne is an unlikely heroine for this book, and at the beginning I had some serious reservations as to whether I would find her believable and whether she would come into her own. She ends up very determined, and she grew on me. With so many books being written about strong female characters these days, I think it IS hard to make them stand out and to make their idiosyncrasies believable. Enne here though has a past that she basically finds out gradually was a lie, and she slowly sheds pieces of herself and gets stronger because she not only has to, but because she discovers a new self and it’s liberating. I loved this part of her story. The other main character is Levi, who basically gets roped into Enne’s search for her mother, with the promise of enough ‘volts’ to make a payment in a bad investment scheme with a rival, should he help her. I really enjoyed Levi’s bad boy character, perpetually doing the wrong thing, confused over his motives, falling for the girl (and guys), and trying to maintain a street lord persona, even though he seemed to be incredibly young to be thrown into that role (mind you, in ALL of these books, these teens seem to take on these TITAN roles, seemingly beyond their years). There were countless minor characters, and should this be a movie, colorful supporting roles, that fleshed out this vivid imaginary world. Also, if it were a movie, it would be a set decorator and costume designer’s dream! Foody writes so much detail and imagery into this book, that at times, it’s a little hard to keep up, but I was engaged and thoroughly enjoyed this all the way through. I would definitely say this is for the upper range of teen years and upwards, as far as teen readers; it’s not light fare. I can’t compare to the previous book but I read at the back of this one, that THIS is the one that Foody threw all her dreams into to write, and I believe it. I’m absolutely looking forward to the follow-up. I know there’s even more of this great story coming.